NASA's Mars rover Curiosity snapped this self-portrait on June 15, 2018, during a growing dust storm. It's still unclear exactly what's ailing NASA's Curiosity Mars rover, but mission team members are optimistic they can get the six-wheeled robot up and running again. Since last Saturday night (Sept. 15), Curiosity has had trouble beaming home to Earth certain science and engineering data stored in its memory. Curiosity has stood down from all science operations while the mission team investigates the problem. "The team is methodically narrowing down potential causes but hasn't yet determined if it's hardware- or software-related," Lee told Space.com via email. The good news is that Curiosity remains otherwise stable, healthy and responsive. For example, it's still sending home real-time engineering data (which is very helpful to the folks trying to diagnose the problem). So this is not a time-critical situation, like the computer problem that cropped up about 200 Martian days (or "sols") after Curiosity's August 2012 touchdown on the Red Planet, Lee said. "During the Sol 200 anomaly, the rover was not responding to commands, nor was it sleeping to recharge its battery," he said. That previous problem, he added, was traced to a combination of two issues: a partial memory hardware failure in Curiosity's main computer, known as the A-side, and a software bug. The mission team ended up swapping the rover over to its identical backup (B-side) computer, which still runs Curiosity to this day. Engineers later fixed the software bug, and the team has restricted use of A-side memory to the amount that's still available, Lee said. So, while the current problem is "quite technically complex," the team is far from discouraged. Curiosity has recovered from seemingly more serious setbacks, after all, and engineers have several options at their disposal to deal with the current one. "The team is confident that they'll find a workaround to allow Curiosity to return to normal science operations," Lee said. "If the problem is related to memory hardware, it may be possible [to] work around any portions of the memory banks that are no longer operating," he said. "If it’s a software bug, a fix can be devised to upgrade Curiosity’s onboard flight software. And, ultimately, there is a backup computer available, albeit with less available memory due to the Sol 200 anomaly." During its six-plus years on Mars, Curiosity has found lots of evidence that the Red Planet could have supported microbial life in the ancient past. 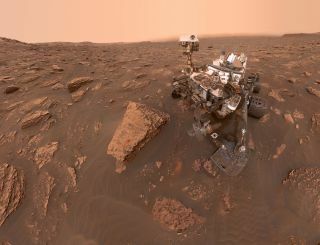 For example, the rover's observations have helped scientists determine that Curiosity's landing site, the floor of the 96-mile-wide (154 kilometers) Gale Crater, hosted a long-lived lake-and-stream system billions of years ago. Since September 2014, Curiosity has been exploring the foothills of Mount Sharp, which rises 3.4 miles (5.5 km) into the sky from Gale's Center. The rover is reading the rock layers as it goes, searching for clues about Mars' long-ago transition from a relatively warm and wet world to the cold, dry planet it is today.